For the past couple of months I have been all about gluten free meals and products. By substituting gluten free bread over whole wheat bread, for example, has made me feel better and lighter than normal. One down side of the gluten free bread is that it isn't always as filling as I would like, especially when you indulge in eating a sandwich. Earlier this summer (yes this post has been a long time coming) I was home alone and decided I wanted to do a pasta night, which really doesn't happen often because I always considered pasta to be a major treat. There is a strong belief that pasta is bad for you, filled with carbs, it'll make you gain weight, etc. Being the foodie nerd that I am, I decided to look up a bunch of nutritional facts regarding pasta. 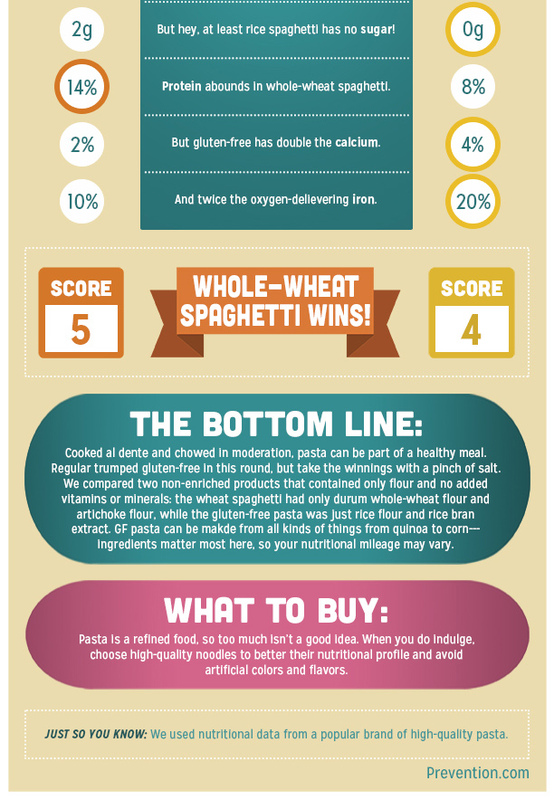 Specifically, I compared whole wheat pasta and gluten free pasta. I ended up stumbling across the comparison graph below. I was totally shocked. First of all, finding out that gluten free pasta has more carbs and in the end really is more unhealthy for you really took me by surprise. Second, all the positive nutrients and proteins that whole wheat pasta can give you also surprised me. Of course I knew that whole wheat anything is usually good for you because of the healthy grains and proteins that are natural found in these products but this almost made me consider adding pasta to my meals more often. If you compare whole wheat pasta to zoodles then yes zoodles will be healthier with regard to calories and carbs because it's a vegetable so no grain at all. But that also does take some important nutrients out of your diet that your body desperately needs, especially if you are active in your fitness and even more so if you are mainly plant based. If I am trying any specific dietary limitations I am doing it by choice not because my body can't handle the product or any other reason. This allows me to be super flexible about what I eat and how often I can eat different things. I do keep up with my flexitarian lifestyle because I am really keen on staying as plant based as possible but sometimes I do eat chicken or whole wheat or dairy simply because my body needs it. Both needing the nutrients and protein that can easily be left out of specific diets (which is terrible for your body) or simply because I am craving it. You have to listen to your body and I am lucky enough to be able to pick and choose from all diets. This is why sometimes I choose to go gluten free for a meal or even a day or week and sometimes I choose whole wheat.